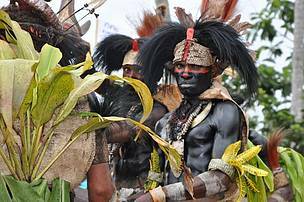 REMARKABLE is the only way to describe Papua New Guinea. One half of an island shared with Indonesia, a hop and a skip from Australia, and almost unknown to the rest of the world. Yet it contains some of the planet’s most extraordinary biodiversity, from the only known poisonous birds, the world’s largest butterfly, longest lizard, the Pacific’s largest area of mangrove forest, coral reef, seagrass beds and the third largest area of surviving tropical rainforest beyond the Amazon and Congo.The list is almost endless and there is more to be found: More than 1,060 new species were discovered between 1998 and 2008. Put in perspective, New Guinea’s tally of terrestrial vertebrates exceeds Borneo’s by more than two and a half times! On top of which, Papua New Guinea is sat on the Equator and is blessed with up to 9m of rainfall a year, fecund soils and is home to valuable minerals like gold, oil, nickel and silver. The 7m population, made up of thousands of clans and speaking more than 1,000 languages is almost entirely self-sufficient in food. The opportunity for WWF is to work with the almost incalculable biodiversity and the communities who live amongst it to develop sustainable livelihoods, land-use planning, develop resiliance to climate change and promote renewables to ensure they avoid the mistakes made by industrialised nations in the past. 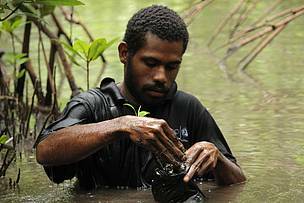 WWF has been working in Papua New Guinea since 1995 and has had a substantial influence on conservation work in the country. It is now based in Madang, on the Bismark Sea and comes under the umbrella of WWF’s Pacific Programme Office. This is one of the most iconic places in Papua New Guinea, yet also one of the most unprotected. Work here, through WWF Netherlands and private donors aims to implement land-use management plans in four provincial government areas through a Kikori Basin ‘blueprint’. Also sustainable development, forestry and livelihood schemes to improve lives in the region. Discussions are ongoing to agree Ramsar designation for Lake Kitubu, which contains a number of endemic fish species. One of the most remote ecoregions in Papua New Guinea – travel is by boat only - but without doubt one of the most important, for both marine species and terrestrial ecosystems.Here we are talking coastal and marine livelihoods on low-lying reefs plus savanna woodlands and forestry. Madang Lagoon and the north coast of Madang Province. Here we are working to build climate change resiliance through mangrove rehabilitation and replanting. This is set to spread up the north coast in the coming year (2014) to beyond Alexishaven to Bogia Station and beyond with support from around 15 different community groups. Three fish aggregating devices will be deployed in Madang Lagoon in the coming weeks (June 2014). It is hoped they will improve the catch for local communties in Riwo, Krangket and Siar/Kaninam and ultimately protect declining reef fish stocks. It is hoped they will improve the catch for local communties in Riwo, Krangket and Siar/Kaninam and ultimately protect declining reef fish stocks. The deployment is linked to the lauch of what may be around 20 different CBO’s who are linked to the National Development Bank through Meri Helpim Meri Foundation. There will be more to come on this. We will keep you posted. Locally known as ‘Kapul’. 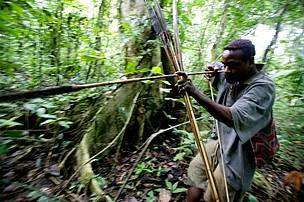 Eight of the world’s 14 known species are found in PNG. There are a also a number of other macropods, primarily because PNG was geologically linked by a land bridge to Australasia. River dolphins. Irrawaddy and, potentially, an entirely new species, the snub-fin dolphin (Orcaella heinschi) discovered off the coast of South Fly.